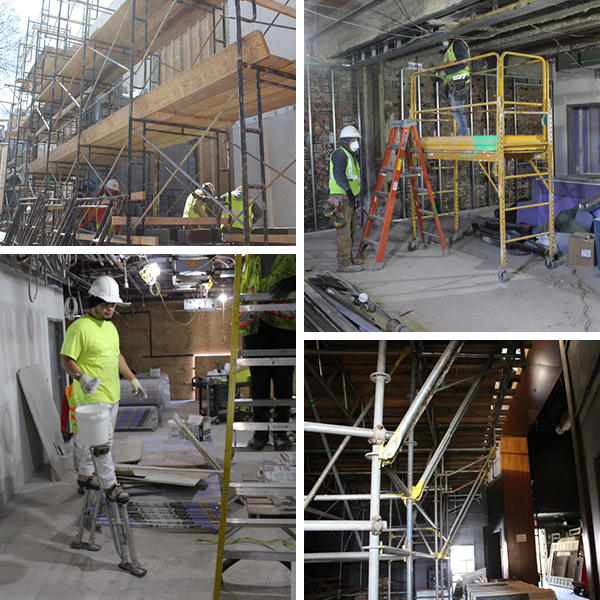 Put on your hard hat and join us for the latest virtual tour of the renovations underway at the Edlavitch Jewish Community Center of Washington, DC. You, and the over 125,000 community members who walk through our doors annually, will be able to enjoy a spectualy renovated Edlavitch DCJCC this summer! Whether engaging in programs for families, young professionals, the LGBTQ community, arts and culture lovers, or volunteers – just to name a few – this new building will benefit our entire community. 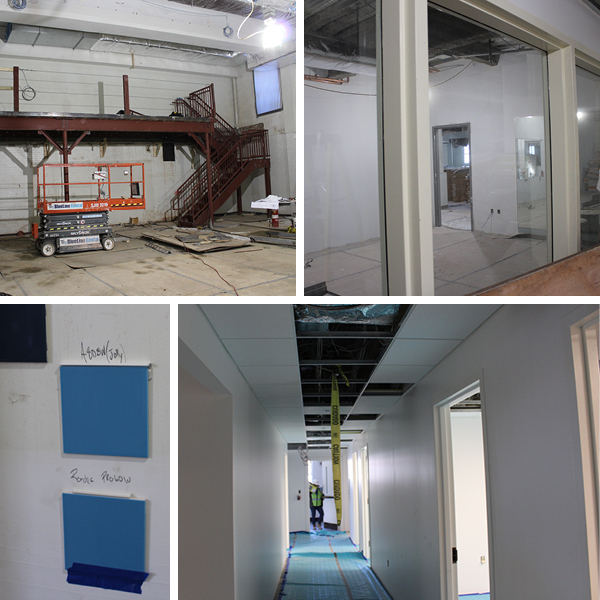 Caption: (From top left to bottom right) The balcony that will hold the projection and sound booth for the new arts space; the new, dedicated group exercise room; paint swatches for a new ECYF space; the refreshed fourth floor administrative offices. We are climbing high, digging in, reaching for the top, and building something new…at 16th and Q.
Caption: (From top left to bottom right) Outdoor scaffolding for the new, dedicated Early Childhood, Youth, and Family (ECYF) elevator and stairway; construction workers in the future ECYF playroom; workers in stilts in what will soon be a brand new classroom; scaffolding in the Goldman Theater. When the EDCJCC reopens this summer, the design of our new building will match the rhythm of our programming and the needs of our constituents. It will be an uplifting, adaptable, and thoughtful space to enrich mind, body, and soul. 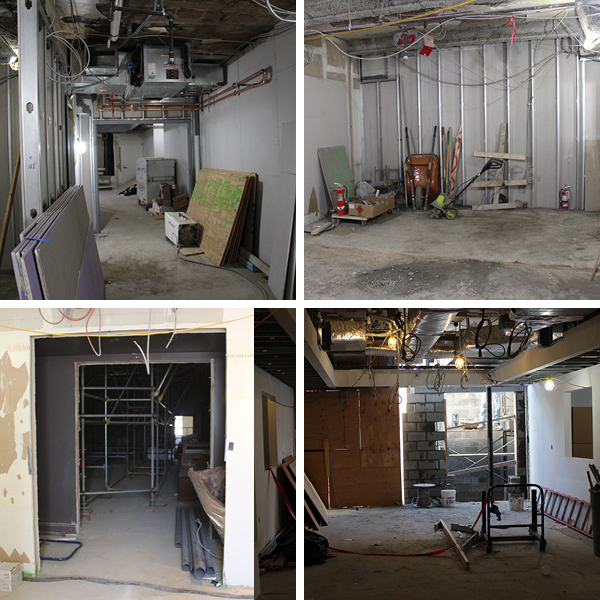 New vestibule entrance to the Community Hall; the new ticket window, where arts patrons and program participants will be able to register for upcoming programs; enhanced entrance to the Goldman Theater; a look, from the inside, at the new dedicated ECYF elevator and stairway. Thank you for being an important part of our community. Your commitment to the EDCJCC elevates life in the nation’s capital!